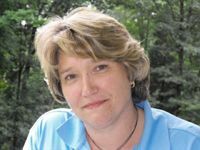 Laurie Bryant teaches English at the middle school and college levels. A freelance writer, she’s been published in magazines, newspapers and websites for audiences of all ages. With a love of developing young writers and actors, she advises her school newspaper, has created a Young Playwrights club and also directs theatrical productions. When time allows, she manages to work in teaching some prepositions and verbs to her seventh graders. A former Communication Arts major, she spent five years working for the ABC Radio Networks in New York City as supervisor of satellite data transmission systems. In search of something she could actually explain to friends and relatives, she followed her heart into teaching and writing. Laurie was born and raised in Staten Island, New York and now resides in Lagrangeville (which many Staten Islanders will correctly place as somewhere between the Bronx and Canada.) She was a full-scholarship softball player, but now enjoys baseball and golf with her husband and sons while they all wait for the Mets to win the World Series again. For more about Laurie, visit her website.